Do you want to ride offroad like a Spartan would? Your time is running out. The Halo series has had an interesting cross-promotion going with the folks at Mountain Dew ever since the days of the "Game Fuel" flavor that launched alongside Halo 3. Halo: Reach, Bungie's farewell to the series, was no exception. Mountain Dew's "Honor the Code" campaign wasn't merely limited to selling questionably tied-in flavors of its caffeinated beverage, though, it was also giving away prizes to Halo fans through its website, like Xbox 360 units and accessories, cool apparel, Halo artwork, and more. But do you know what's cooler than giving away a Halo: Reach-themed Xbox 360? 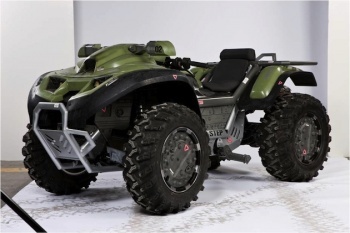 Giving away a life-sized and fully functional Mongoose ATV, customized by WETA Workship to look and feel just like the ones driven by the Master Chief (and company) in the Halo series. There are only two of these sweet little quad-bikes up for grabs, and the first is being given away later today. The second will be given away on November 22nd, so if you're feeling lucky you still have some time to go grab some Doritos or Mountain Dew to get a promotional code. Enter it in the site linked above, choose the ATV as your prize of choice, and cross your fingers. Even if you don't win the ATV, the promotion itself lasts through November 28th. Who knows? You might get lucky. And if you do, I call that I get to drive that thing at least twice, because I told you about it in the first place.